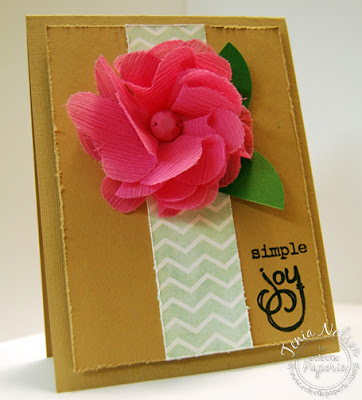 It is Tenia from Jazzy Paper Designs!! I created this very CAS card using awesome eP product and it goes a lil somethin' like this......CHECK IT!!! I used the Simple Joys stamp set from Market Street Stamps, I used DP from My Mind's Eye Tangerine line, and I also used the Vintage Gauze Blossoms from Maya Road. Thanks for stopping by and have a great day!! What a lovely flower - turns it into a really special card!